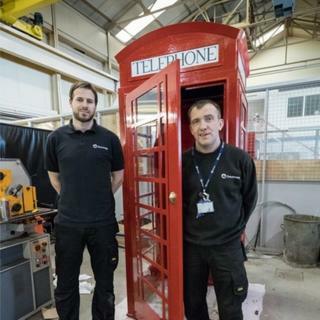 Apprentices at a nuclear energy complex have built a life-size replica red telephone box for a hospital's therapy garden. It was designed and constructed at Dounreay, near Thurso, in Caithness under the guidance of experienced tradesmen at the site. The box will be installed at Wick's Town and County Hospital Memory Garden. The garden was created to provide patients, including people with dementia, a peaceful space. Apprentice Mark Fraser designed the box during his placement in Dounreay's design office. Fellow apprentice Jimmy Budge carried out the majority of the build work with help from others. Carol Robertson, apprentice training manager, said: "The apprentices have produced an excellent piece of work. "You would have difficulty distinguishing between an original phone box and the one they have created." Dounreay is an experimental nuclear site which dates to the 1950s and is in the process of being decommissioned.